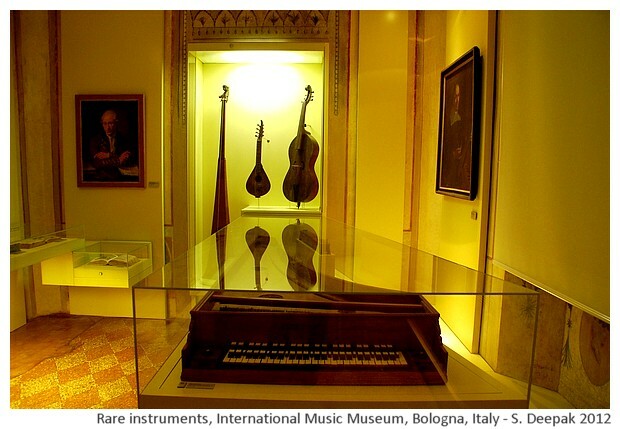 Bologna (Italy) has a special museum with one of the largest collections of western music-related books, instruments and paintings from around the world. It's origins were linked to a music loving priest. The building that hosts the museum also has a rich history. This photo-essay presents a virtual tour of the museum and its history. 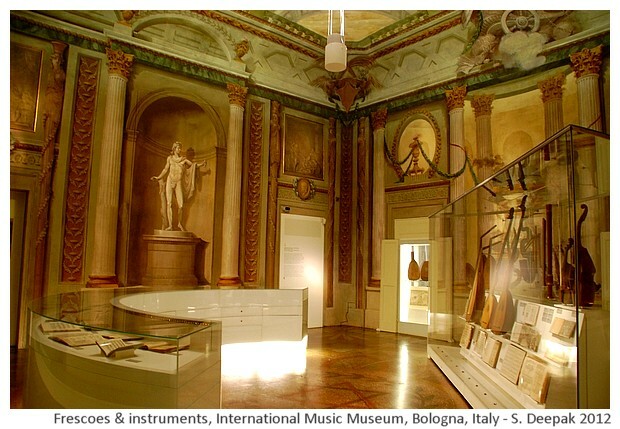 When I had first heard about the music museum of Bologna, I was a bit confused -.how can you put music in a museum? May be they will keep old recordings of the music, I had thought. In India, music has been exclusively an oral tradition - the different Ragas and their rules are taught from teachers to the students, but traditionally they were not written down. In the west the earliest examples of written down music came up in 6th and 7th century when Plainchants were written for Gregorian prayers. With passing of centuries as the Gregorian chants became more complex, the accompanying music notations also evolved. The notations on five lines came up around 14th century. With the invention of movable types printing press in the fifteenth century, carefully handwritten music notations could be mass-produced for the first time in history. That was also the period when the formal structures of what is called symphonic music and opera music were being defined in Europe and especially in Florence and Naples in Italy. 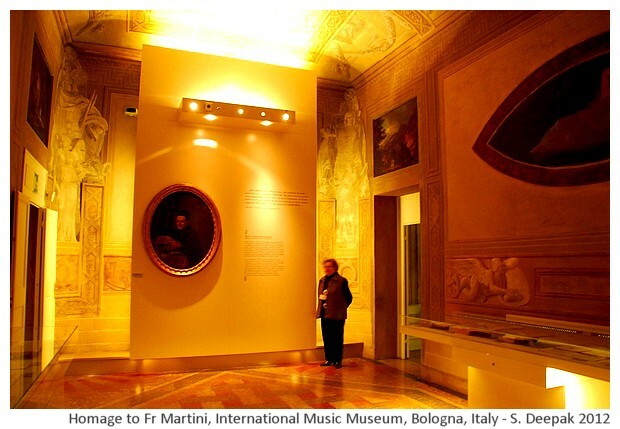 The international music museum of Bologna has the origins of its important music collection in the work of a priest called Fr Martini. Fr Giovanni Battista Martini was born in Bologna in 1706. His father was a violinist and he studied music from a young age. He entered the Franciscan order of priests in 1722, when he was 16 years old. Three years later at the St Francis church, his music compositions received wide appreciation. Later, in 1758 AD, Fr Martini joined the Academia Filarmonica (Philharmonic Academy) of Bologna, one of the most important music schools in Europe at that time. He was the "definitore perpetuo", the person called to resolve and decide the music related controversies, of the Academy. He had this role till 1781. Fr Martini's fame spread fast and promising music students came to his school from different parts of Europe. For example, around 1755 Johann Christian Bach, youngest son of Johann Sebastian Bach, came to Fr Martini to study music. In 1770 Wolfgang Amadeus Mozart took the entrance test to become a member of Academia Filarmonica. Fr Martini hardly ever left Bologna, except for some music concerts. In 1756 AD, pope Benedict XIV asked him to transfer to Vatican to the St Peter's church, but he excused himself saying that he was not well. Yet, he was able to knit a network reaching far away parts of Europe and even outside. Fr Martini was interested in collecting music manuscripts, the written down notations of religious music, symphonies and operas. His fame as a music teacher and his role in the prestigious Academy, helped him in writing to people and to churches all over the Europe to ask for copies of any old music notations. Many of the churches, who had their old prayer books with music notations were happy to give them to Fr Martini, in exchange for new music books. Thus the collection of Fr Martini grew. Fr Martini wrote "The history of music", one of the most significant works on music history of its time. He was supposed to write it in five volumes. However, only three volumes of this book were published as Fr Martini died while he was writing volume four. He also wrote around 700 musical compositions. In 1750, pope Benedict XIV had given assurance that the music collection of Fr Martini will be archived and kept safe by the church. When Fr Martini died in 1784, his music collection had around 17,000 volumes. 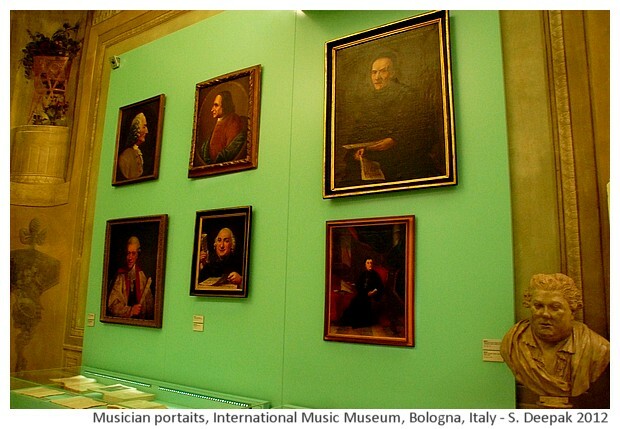 He also collected music instruments and paintings of his students and other famous musicians. During Fr Martini's time, Bologna was a Papal city, governed by Vatican with support of Austrian military. In 1796 when Napoleon attacked Bologna, part of those materials were taken to Austria, where they are now kept in Vienna library. In 1827, Fr Martini's collection was used to set up the library of the Philharmonic academy of Bologna. 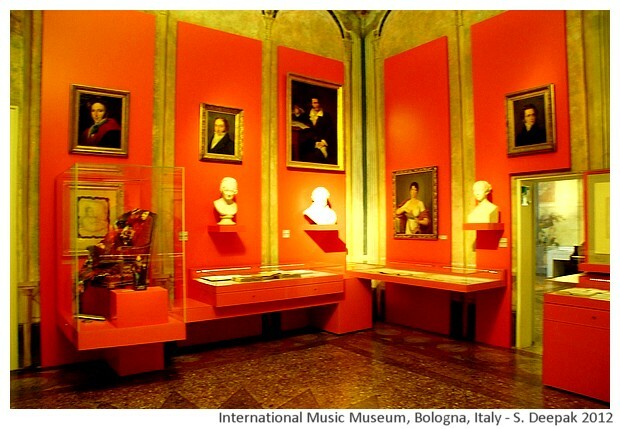 In 1986, when the international music museum was set up in the Sanguinetti Palace in Bologna, the library collection of Philharmonic academy was shifted there. Sanguinetti palace underwent a long period of restoration before it was opened to public in 2004. 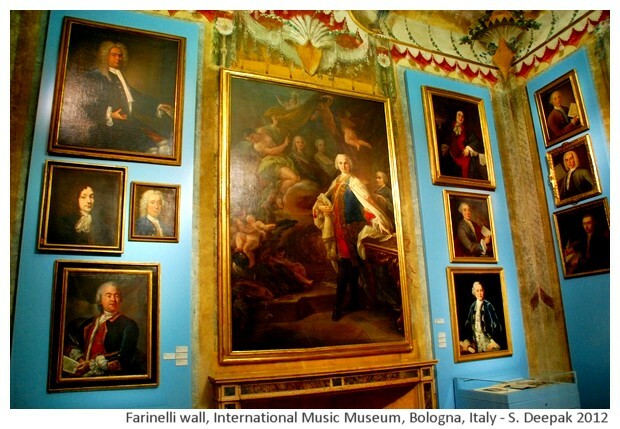 However, apart from Fr Martini, Bologna also had many other important music personalities, whose music related objects were part of city's heritage. 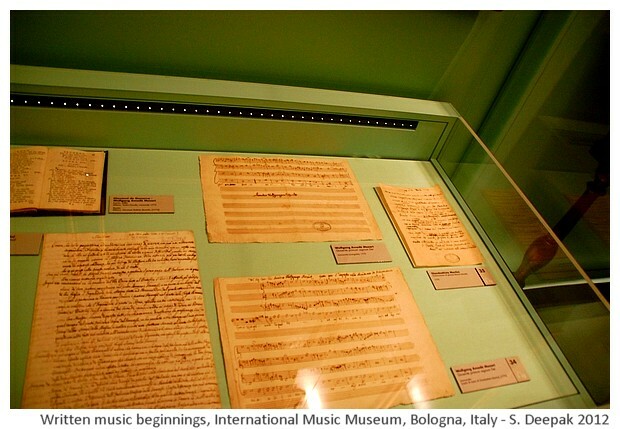 Civico Museo Bibliografico Musicale or the Musical Bibliographical Museum of Bologna, was founded in 1959 to hold the Comune di Bologna's collection of musical objects. It was renamed International Museum and Library of Bologna in 2004. 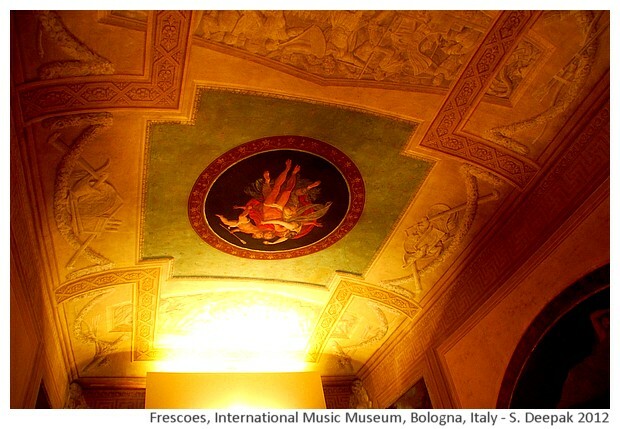 The international music museum of Bologna is located in the Sanguinetti palace, an old noble house in the city centre of Bologna. In 16th century this building belonged to Riario family. Near the end of 18th century, when Bologna was a Papal city, Napoleon Bonaparte from France came to "liberate" Bologna. For some time, Napoleon's forces won the war and count Antonio Aldini was appointed as his Secretary of State of his Italian reign. Count Aldini came to live in this building. 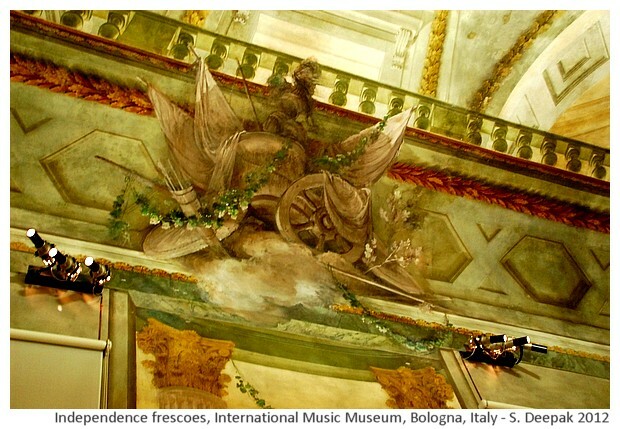 Many of the rooms of the palace were redecorated and symbols of Italian independence from Papal rule were painted including tricolour flags and "bands of grain" ("fasce" in Italian that were later taken over by Mussolini and gave rise to the term "fascists"). However, Napoleon's rule did not last very long and Pope's forces, supported by Austrian military, re-occupied Bologna. In 19th century, this building was bought by a well known opera tenor singer Domenico Donzelli, and some time, even famous music composer Gioacchino Rossini also lived in this building as guest of Donzelli. Donzelli was very famous in the first half of nineteenth century and performed in operas in Naples, Paris and London. A couple of years before his death in 1873, he sold this house to another noble family - the Sanguinetti. The building was donated to the municipality of Bologna in 1986. Renovation of the building in the 18th century, brought many famous artists to design frescoes in this building. 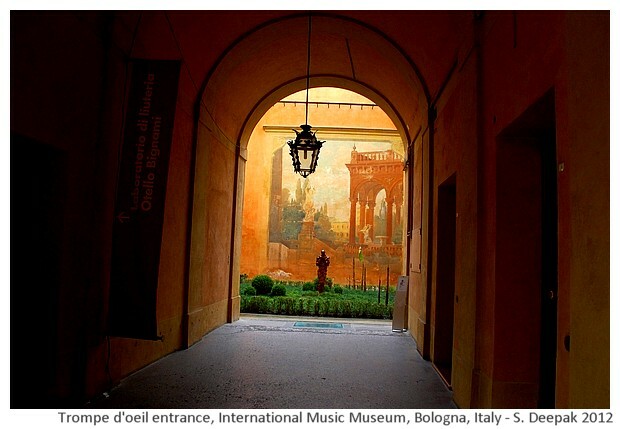 On the ground floor, there is a trompe d'oeil (painting for giving an optical illusion) by Luigi Busatti. 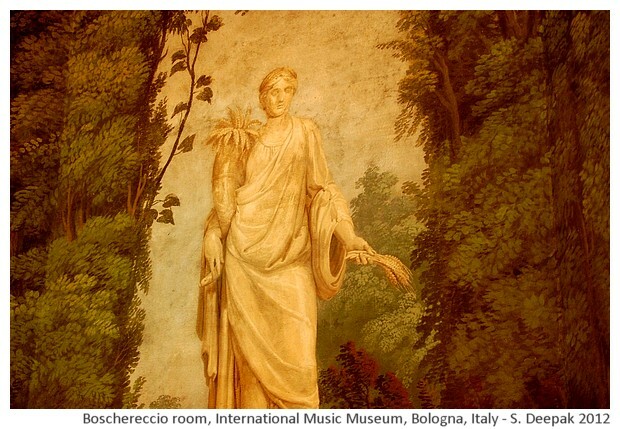 On first floor, room used for dining by count Aldini, has a magnificent example of "Boschereccia" (the forest). 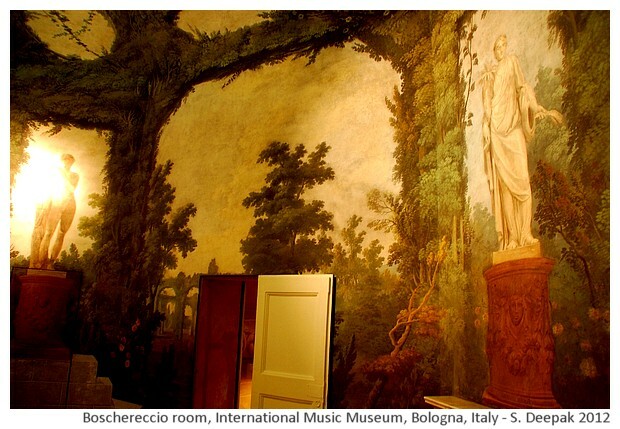 It was fashionable in 18th century Bologna to paint plants and trees on the wall of a room to give it the look of a garden and these rooms were called "Boschereccia". Usually these rooms were built on first floor of noble houses, because usually the families lived on this floor. The boschereccia room of Sanguinetti palace has some paintings by the young Pelagio Pelagi, who later became famous as an art collectionist and as an artist. In other rooms of this building, while you admire the beautiful frescoes, you can still see partial signs of Napoleon's arrival and the "independence" of Bologna with the three colours of Italian flag along with bands of grain painted in different places on the roofs of the rooms (though when Papal forces retook Bologna, they had tried to cancel those frescoes). 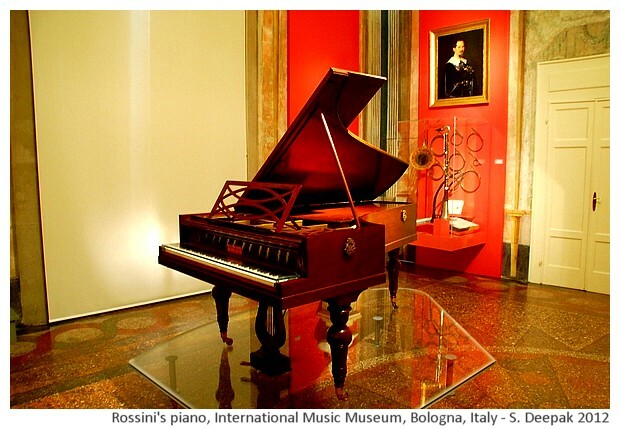 The museum gives you an opportunity to look at original music notations and books from the past 5-6 centuries, different kinds of music instruments, portraits of famous musicians, music instruments used by famous musicians (especially musicians like Rossini, who lived in Bologna). The museum organises numerous initiatives including guided tours and music laboratories. 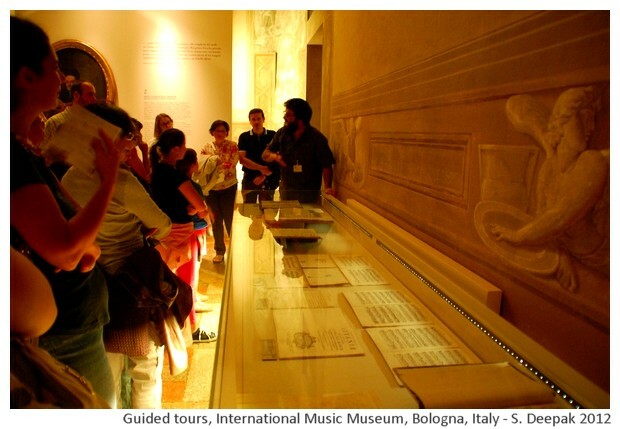 A visit to the museum is an opportunity to look at music in terms of its history, its academic study and its evolution. 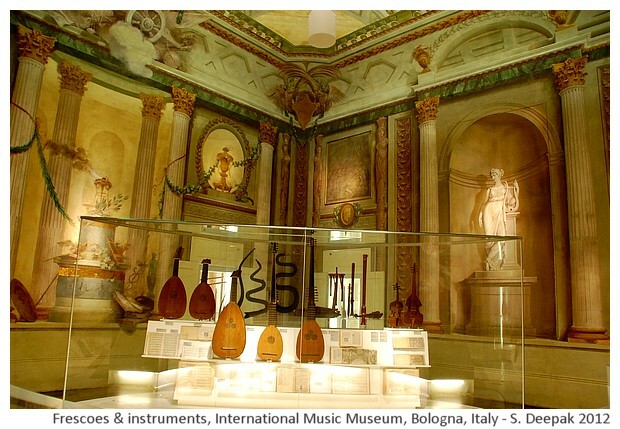 The international museum of Bologna is a very special place for lovers of western classical and operistic music. 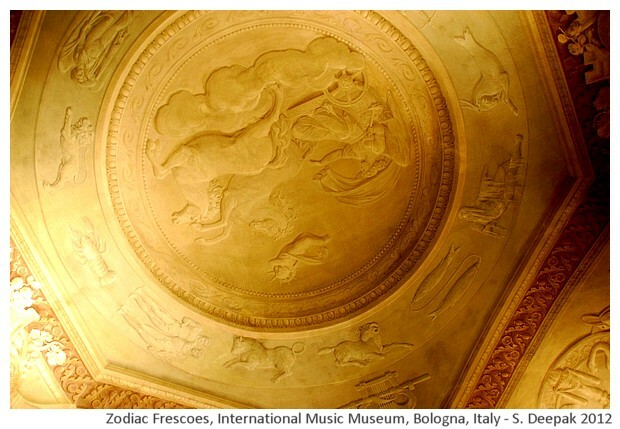 In a wonderfully frescoed building steeped into history, it gives you a unique view towards the evolution of the music world over the past centuries.